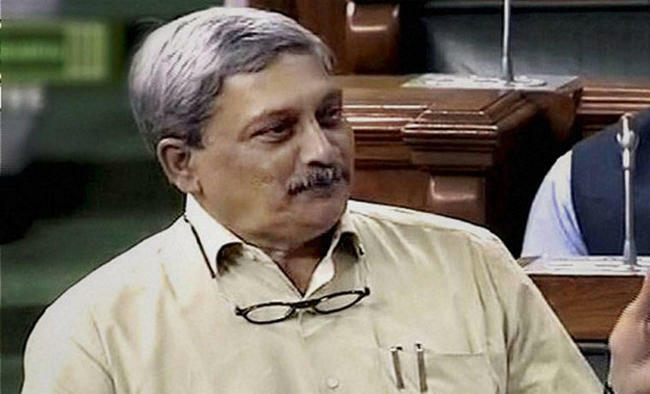 Panaji:Defence Minister Manohar Parrikar will be the next Chief Minister in a BJP-led government in Goa, Union Transport Minister Nitin Gadkari announced on Sunday. "The Defence Minister will resign before he takes oath as the new Goa Chief Minister," Gadkari told reporters here. Earlier, Bharatiya Janata Party leaders, led by Parrikar, met Goa Governor Mridula Sinha to stake claim to forming the government in the coastal state. The move followed the newly-elected BJP MLAs on Sunday passing a resolution demanding the return of Parrikar as Chief Minister. Parrikar, Gadkari and caretaker Chief Minister Laxmikant Parsekar were also present at the meeting. At the press conference, Gadkari said the BJP has the support of 21 lawmakers in the 40-member house and "we are likely to get the support of one or two MLAs" more. Earlier, in a sudden development, BJP leaders, led by Parrikar, met the Goa Governor to stake their claim. The BJP contingent of 13 MLAs was accompanied by three legislators each of the Goa Forward party and the Maharashtrawadi Gomantak Party and three Independent legislators. "We have decided to support the BJP for formation of government," Goa Forward founder-member Vijai Sardesai told reporters before proceeding to the Raj Bhavan. The BJP, which won 13 seats in the February 4 election, needs the support of eight legislators to hit the majority mark of 21. With the Congress (17) and BJP having accounted for the bulk of the seats, both had been wooing smaller parties to form a coalition government.